Throughout the United States, Perma-Liner has more than 1900 certified installers and four distribution facilities, with more to open in the coming months. One of our certified installers recently completed a project we would like to highlight. 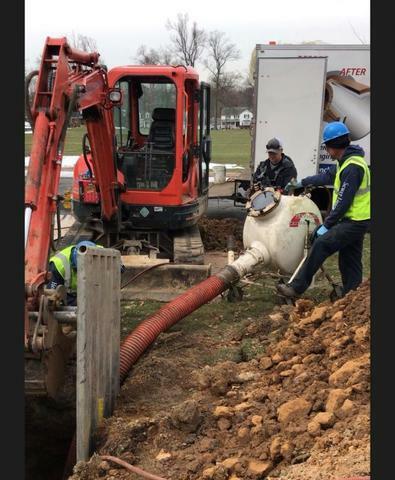 Headquartered in Chatham, New Jersey, Pipe Works Services, Inc. has been offering its services to the residents of Northern New Jersey since 2000. With their reputation and 24-hour emergency service, they continue to be one of Northern New Jersey’s most trusted experts when it comes to plumbing services. Recently, the Pipe Works team repaired a homeowner’s broken sewer pipe by using a 4” liner through 70” of the pipe. The repair was done in mere hours by using the CIPP method. This not only saved time but also money and landscaping woes for the homeowner. For more information on Pipe Works and their projects, visit their blog. If you are looking for information on protecting, lining and repairing pipes, or for the nearest installer, contact Perma-Liner today. Perma-Liner is the leading manufacturer and supplier of trenchless pipeline rehabilitation equipment and materials in North America. For almost 20 years, we have developed systems to rehabilitate existing sewer systems without excavation. Our experience in the CIPP industry has allowed us to design, patent and manufacture state of the art technology in order for us to repair structures without excavation.